Bond, or in more sophisticated way of expression, Fixed Income can be a ‘paradoxical’ financial instrument in some sense. The reason why I say as ‘paradoxical’ is, generally the bond market suffers from the rise of market interest rates when overall economy is booming, while bond investors are making profits when the economy is suffering. Therefore, most of market participants in bond market looks the financial market in an opposite side of the stock investors, and bond investors make money when majority of stock investors are losing. Also, as most of major market participants are institutional investors and direct participations from individual investors are quite limited, this market is not well known and not much interested by most of people out of this world. Let’s take a look at the chart below. 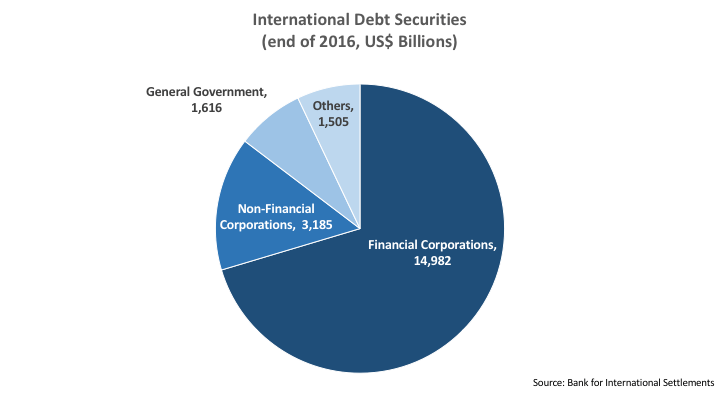 The data was published by the Bank of International Settlements, or BIS in short, and the numbers are total ‘International Debt Securities’ outstanding at the end of 2016, in billion US dollars. Total number was US$ 21.288 trillion. Isn’t this huge? More importantly, the chart and numbers above are just counting so called ‘International Debt Securities’. If we count ‘Domestic Debt Securities’, the number should be even larger than these. 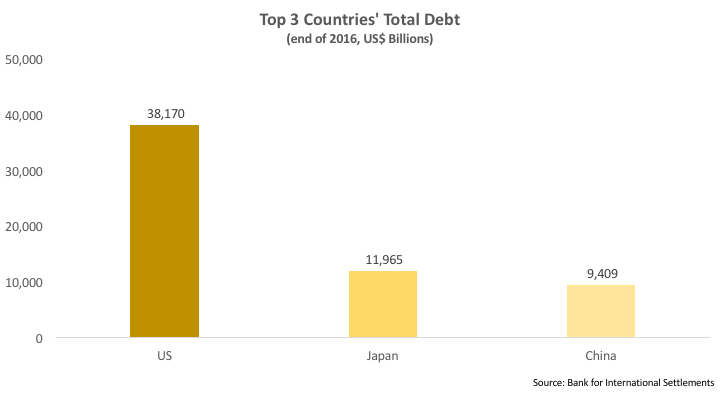 For example, only top 3 countries in terms of total debt outstanding, United States, Japan and China numbers look like this. As you can see, only US’s total debt outstanding is US$ 38.17 trillion, which is even larger than total international debt securities. Japan follows as US$ 11.965 trillion and China is next to be US$ 9.409 trillion. Note that, only these top 3 debt issuing countries count for US$ 59.544 trillion outstanding debt, really huge size market. However, how many people know about this market and closely monitor what is going on there? How many people do you think fully understand what happened in 2007-2008 subprime crisis? How many people know how subprime mortgages drove Lehman Brothers to bankrupt? Anyone understands ABS (Asset Backed Securities) CDOs (Collateralised Debt Obligation) triggered those events? Do you know what exactly happened in 1997 Asian crisis to most of Asian developing countries? This is why the bond market is so important for overall economy and for all of us. The things that you have never heard about is impacting on your job security, housing prices that you own, depreciations of your personal belongings and many other bad things on yourself. But still this market is very closed market, and that’s why I named this series as ‘The Market of Their Own”. Hereby, I am trying to help people understand very basic concepts of bonds, bond markets, and some other markets related to bond markets. These wouldn’t be enough to fully understand the market and various fixed income products, but I hope this can be a good base of your further studies and understandings. Hereby, I am trying to help people understand very basic concepts of bonds, bond markets, and some other markets related to bond markets. These wouldn't be enough to fully understand the market and various fixed income products, but I hope this can be a good base of your further studies and understandings. Previous PostPrevious 전세제도는 사라져야 한다. Next PostNext Is Bond difficult to Understand?